We have periodic dinners at our church, and I often found it difficult to keep the lid on my casserole dishes and also keep them warm till we got there. 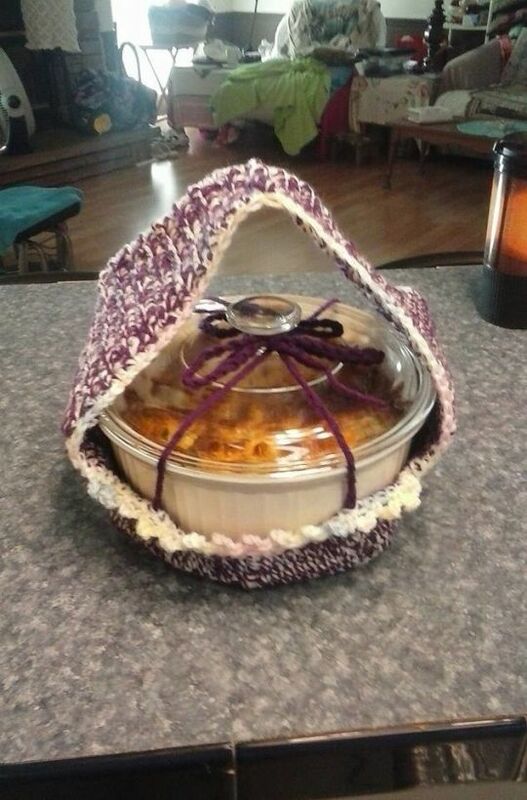 I did these freehand, to fit my casseroles, and made ties to keep the lids from moving. I can also secure my serving spoon under the ties. I used a double strand of yarn for both strength and heat retention. They work wonderfully and I am very pleased with the outcome. what a great idea to have something for tying down the lid!!! Wonderful! What do they say about necessity causing invention? Nicely done!